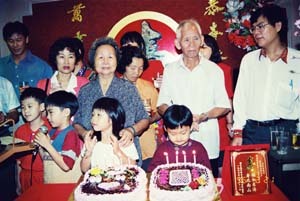 IN HAPPIER TIMES... Tan's children organised a grand birthday dinner bash for him on his 80th birthday. It has been almost a month since Roger Tan's father went missing. On this Father's Day, the family is appealing to the public to help their father find his way home, writes IVY SOON. It was not the first time that Roger Tan had received a call telling him that his elderly father was missing. However, over the last two years, residents in Yong Peng, Johor had always brought his father home safely. Since May 23, the family has been looking tirelessly for his father, Tan Sue Yong, 83, who has Alzheimer’s disease and suffers from dementia. On the night that Tan went missing, Roger’s family and friends, as well as Rela members, combed the jungle around Yong Peng in vain until four in the morning. “My father used to work in the jungle, clearing it on contract basis. He is familiar with the jungle, and regards it as a second home. He usually likes to wander into the jungle because he feels at home there,” says the 38-year-old lawyer. Tan was spotted at the pasar malam and a supermarket in town. A salesgirl told Roger’s family later that she helped to test a clock for a white-haired, elderly man. It was not the first time that Tan had failed to come home. He went missing for several days two years ago. TAN has white hair, is five feet four inches, and was wearing a short sleeved grey shirt and brown pants when he left home. He can only speak Hockchew. If you see Tan, please take him to the nearest police station. Call the Yong Peng police station at 07-4671222 or the head of rescue operations at 019-7651289. For the latest update on the searc for tan, go to the website www.rtkm.com.my/dad. “That time, he was out riding his motorbike. A good samaritan found him wandering about in Malacca and took him home. Until today, we have no idea how he managed to ride all the way from Yong Peng to Malacca on his 20-year-old motorbike,” recalls Roger. It usually takes about an hour by car from Yong Peng to Malacca. Since that incident, Roger and his family had removed the motorcycle. They also began to take steps to cope with Tan’s deteriorating memory after doctors verified that he has Alzheimer’s disease and suffers from dementia. “We were told that we had two options; to put him under medication or keep him as comfortable as possible in a familiar surrounding. We tried putting him on medication but it made him drowsy and robbed him of his ability to care for himself. Other side effects included hallucinations. “So, we opted instead to let him remain in Yong Peng where he lives with my mother and a maid. We tried bringing him to live with the children, but he gets agitated. He always insisted on going home to Yong Peng,” says Roger, who also points out that they had to respect their father’s views. Dementia aside, Tan is otherwise hale and hearty. He has trouble remembering the present, but his memory of past events is vivid. Last Easter, says Roger, he was able to recite a poem that a priest had taught him over 70 years ago in his church in China. At other times, he cannot even recognise his six children and 15 grandchildren although they take turns to visit Tan and his wife every week. Confining Tan in the house was never an option, says Roger, because his father likes to keep active. Tan’s life has been one of hard toil and sweat. Tan who came from China in 1947, was a dutiful father and was determined to bring his children up well. When Roger was naughty, Tan would beat him in front of his other siblings. But later at night, he would ask Roger where it hurt and apply balm to his wounds. “He only retired at 70. Even after that, he continued to work in his rubber estate. We told him that he should take it easy in his golden years; to go to the coffee shop and chat with his friends,” Roger recounts. Tan was, however, not inclined to remain idle. He would go for walks twice or three times a day. Sometimes, he would ramble in the jungle, perhaps because it reminded him of working in his rubber plantation. After the Malacca episode, Tan’s children tried to prevent him from wandering out on his own. They locked the gate, but Tan used a ladder to climb out. They took away the ladder, but Tan shook the gates and threw a tantrum. Fiercely independent, he would not even allow the maid to accompany him. Since their father’s disappearance was publicised in the newspapers, Roger Tan’s family has received many telephone calls. Some of the callers have provided crucial information on his father’s movements since his disappearance. The day after he went missing, Tan was reportedly spotted at a poultry farm in Jalan Labis. They searched in that area until one in the morning, but their efforts proved futile. Two days later, a neighbour saw Tan wandering about in a deserted housing estate. He was next seen getting off a lorry at a palm oil estate about 12km from Yong Peng. A guard saw him walking into the estate. Again, Roger’s family and field force members with tracker dogs went in to search for Tan. Again, their efforts came to naught. “My father was last see boarding a bus from Johor Baru to Air Itam on May 27. He has no money with him, and left home only with his identity card. “He could be travelling from town to town. He might not even realise that he is lost. He might be thinking that he is back in his younger days in China, happily travelling from one town to another,” says Roger with a rueful laugh. The police, hospitals, RELA, MCA members, Council of Churches, the Boys and Girls brigade, have all been alerted about Tan’s disappearance. Yong Peng residents are also on the lookout for him. “Many have come forward to help us. We thank all of them, especially Datuk Ong Ka Ting, Datuk Chua Jui Meng, Johor chief police officer Datuk Zulkipli Mat Noor and Perak chief police officer Datuk Mariman Mohd Taib,” says Roger. Others have been more unscrupulous, preying on Roger’s family’s anxiety and fears. One caller insisted that their father had been murdered, his arms and legs amputated, and stowed away in a coffeeshop somewhere. “We did not believe that caller because we were sure that such a find would not go unnoticed. The police would have notified us,” says Roger, who has led the tireless search for his father. Roger’s family has also been besieged by crank calls, some offering tip-offs they could not afford to ignore. Hence, in their desperation and vulnerability, the family has been led on a wild goose chase. One led them to Ipoh, and another to searching through a cemetery after midnight. Roger stresses that his family is not rich; “We are an average family like most,” he says. Despite such unpleasant incidents, the family has faith in the public’s goodwill and kindness. With well-wishers’ help, Roger’s family pooled their resources to place full-page advertisements in major newspapers yesterday to appeal to the public to help bring Tan home for Father’s Day. “If you see a bewildered old man alone, please do not dismiss him as insane. He could be suffering from dementia, and cannot remember who he is and where he is from. Please approach him and help him,” appeals Roger.